So, have you seen all the wonderful creations this week from the August Release at Peachy Keen Stamps?? Today I have a card to share with you that uses the August KOTM. If you would like to have some SERIOUS crafty overload, hop on over to the Peachy Keen Stamps blog to see what all the other designers have been busy creating with this new August release. I hope you can join us tomorrow night during the super fun release party over on the Peachy Keen Stamps Ning site. There will be some more fab inspiration, challenges, and prizes. Plus, these AWESOME stamps will be available for sale on the Peachy Keen Stamps website, too. So cute, Amy! This would be the perfect card for my classroom volunteers! Love it! Great card, love the sewing you added. 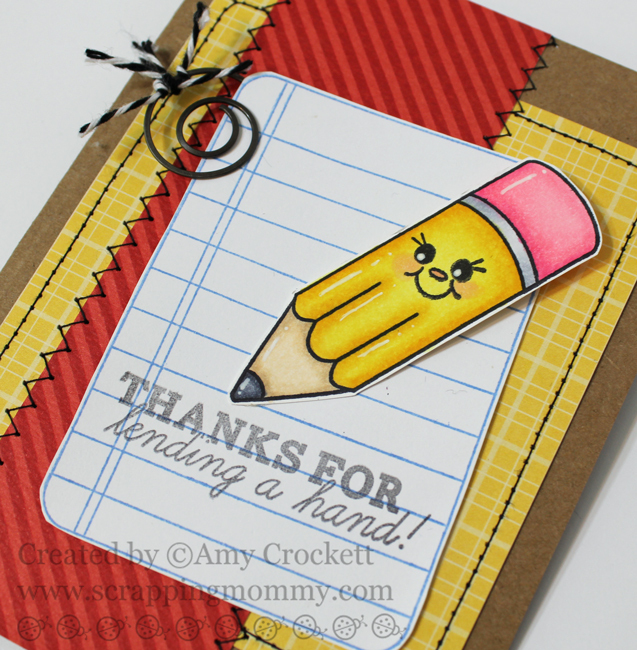 This is just toooooo cute love the PKS face on the pencil perfect back to school colors. This release is so cute I just can't stand it!!! You are one amazing designer my friend! Sophisticated or Simple...your designs are always spot on!!! Amy ~ oh this is just ADORBS! I LOVE this release!!! Oh your coloring of that pencil ~ ROCKS!!!! You just make the most GORGEOUS cards! LOVE this card Amy! You could just pick that pencil right off the page it's coloured so beautifully!